With the Job Alerts plugin, registered users on your site can create job alerts based on searches (by keyword, location keyword, category) which are delivered by email either daily, weekly or fortnightly. 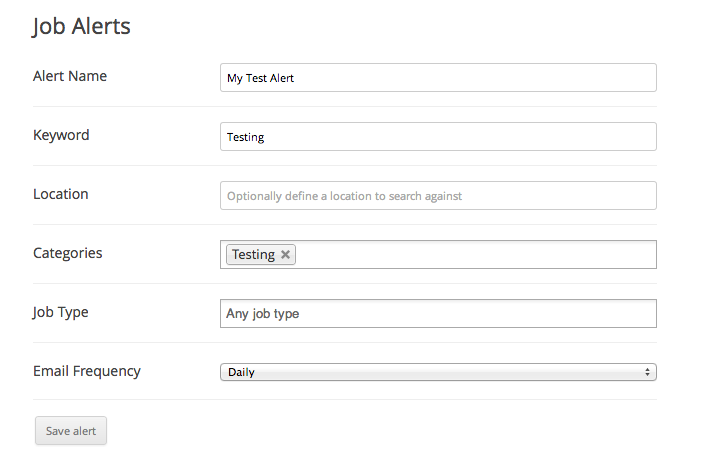 This will house the page where users setup and manage their alerts after becoming users of your site. Note: This plugin handles the alerts page but not the registration flow. You should use WordPress core functionality for this and set up registration links/explanations for your users so they are aware of the alert functionality. Once you have your page setup, you can head over to Job Listings > Settings > Job Alerts to configure the plugin’s settings. Alert Email Content – This option controls the content of your alerts emails. Emails are plain text. 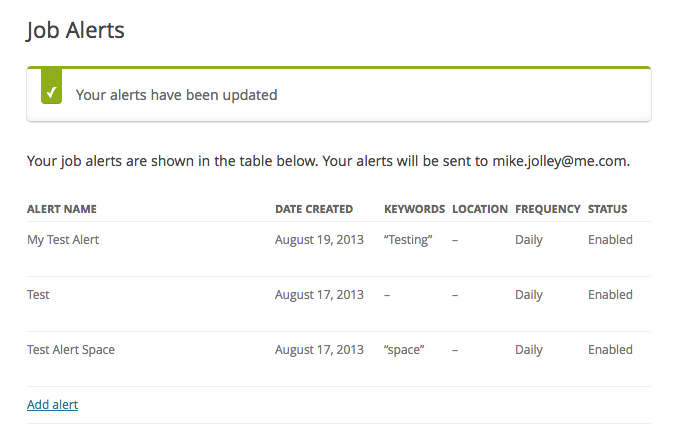 Alert Duration – Entering a number here will cause a users alerts to expire are X days. When expired, the user can login to their alerts page to re-enable them for another X days. Alerts Page Slug – important: this is the slug of the page which you setup to house the [job_alerts] shortcode. The plugin uses this for links etc so it knows where to send the users to manage alerts. Alerts Page ID – Select the page where you have placed the [job_alerts] shortcode, so the add-on knows where to link users to view their alerts. Once an alert is created (or enabled) a WordPress cron event will be scheduled. When this event is triggered, the alert will be sent and another cron will be scheduled. This process will repeat whilst the alert is active. If you see this, remove it!. However, with some hosts, if this address doesn’t exist as a mail account on your server, then it may be replaced, so you will find alert emails being sent from an email address belonging to your hosting provider.